This colorful painting was a gift from a dear friend the couple met while in Congo. 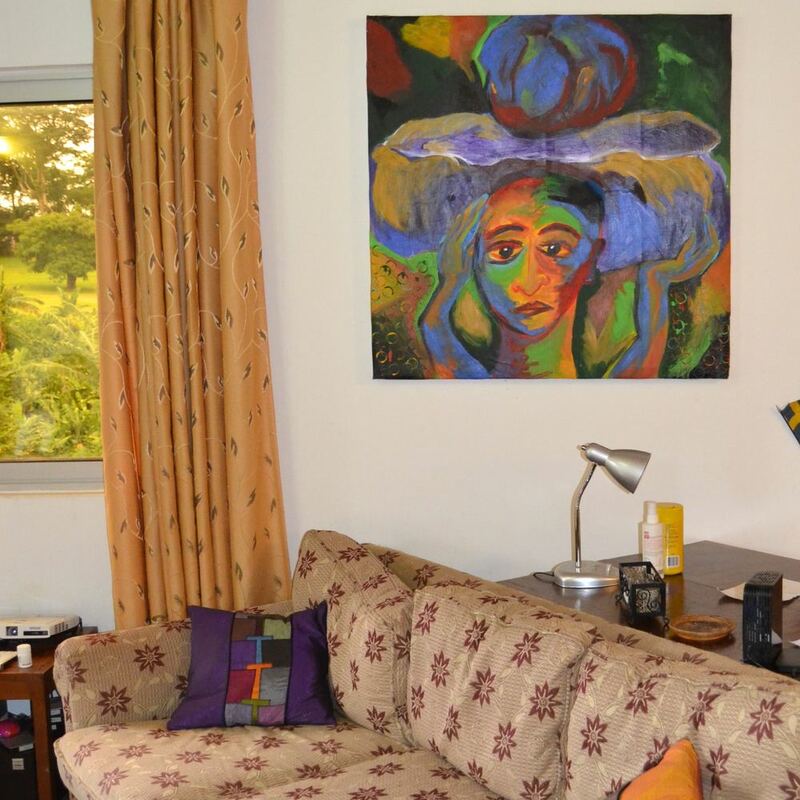 At the foot of Yaounde’s golf course sits the spacious and inviting home of Matt and Betsy. Filled with treasures from their visits to over 60 countries, the walls and shelves are a veritable global gallery. A 360 turn in their living room is like taking a tour around the world while standing in place. Their carefully curated collection is composed of pieces purchased while making a connection with the artist. From tapestries created by local artisans to abstract portraits painted by longtime friends, each piece tells a story more captivating than the last. The couple’s courage to never stop exploring matched by their curiosity about the world fills their apartment with an intoxicating wanderlust. Meanwhile, their contentedness and ability to love each new country they call home makes the space feel cozy and complete. 1—Sitting on the balcony is as good as a vacation. The golf course is right there on beautiful Mt. Febe. There is a stream passing by and mixed with the soft chatter of the golfers, the sounds are really peaceful. 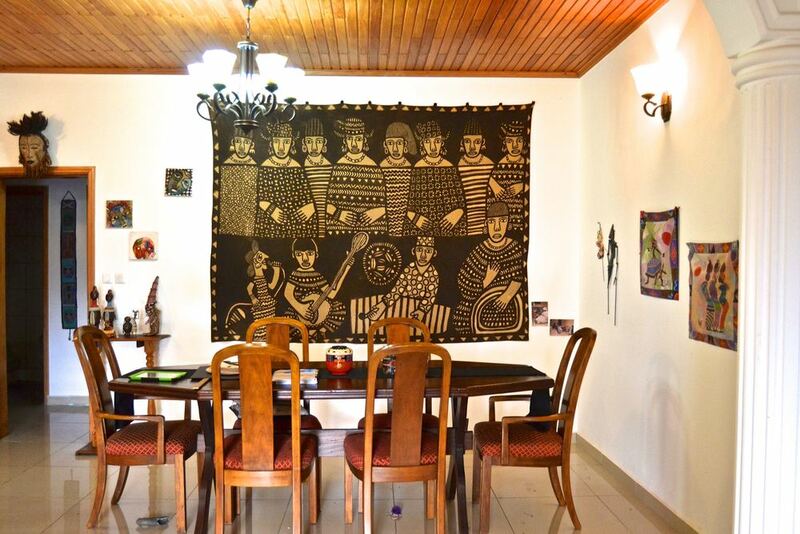 2—The beautiful, large tapestry behind the table in the dining room is a mud cloth representing a wedding in Mali. When we found it, we had just attended a wedding in the country a few days before. Then, while visiting a local village, we chanced upon a woman painting this beautiful wedding scene. We were thrilled to be able to bring it home to with us as a way to commemorate the celebration we'd just attended. 3—The wall hanging just outside of the bedroom is made of the collars of beautiful robes from India. 4—The piece above the bed is also from India and brings so much color into the room. 5—The rooster made of recycled materials is from Morocco. We fell in love with the piece and were thrilled to add it to our collection. Awhile later, the artist was featured in a high-end magazine. We were so glad we got the piece when we did! 6—The framed costume is from Benin. We saw a man wearing it in a village one day and then found him again the same evening when we were able to buy it from him and bring a piece of tradition home with us. 7—The abstract, colorful portrait in the sitting room was painted by a dear friend in the Congo who is now living in Ivory Coast. It is a great piece to remember her by. 8—Of course Betsy’s family bible from 1766 is an immense treasure. We never check it in luggage when we’re moving. We always safeguard it as a carryon. It is such a precious heirloom. A: Every night, when returning from teaching, we pass a green area with beautiful flower nurseries. It is one of our favorite places. We also love the bush bars—very local places tucked away and great spots to really connect with the people here. Finally, we love the view from the top of Mount Febe. A: Really, we have felt at home in every place we’ve lived. There are aspects to every place we’ve lived that we really love. We always say that if we could take our favorite parts of each place, we could create the perfect city. We haven’t lived in Southeast Asia yet, but those countries really call to us.